The next morning, Dennis woke us at 6:00 a.m. and we left for Killarney. We wanted to leave the small craft channel and sail in the big water. The day was overcast and hot. We sailed for a couple of hours but were not making much progress. We motored until the early afternoon. We started feeling very tired and stunned. All three of us stared out of the cockpit at the grey sky and grey water. The drone of the engine was putting us to sleep. We stopped Hetarae in the middle of the lake and we all took very quick swims. The water was numbing, but we did wake up! Finally, in the late afternoon, we reached Killarney and the North Channel. After feasting on Hebert’s fish and chips, we ran errands. I went in search of a bank machine and Dennis dragged the dinghy motor to a repair shop. Nick went jogging. I was unsuccessful in finding a bank machine and the prognosis for the motor was dim, so we headed out for our all time favourite anchorage, a little tiny spot beside Covered Portage Cove. We arrived in good time and got the place to ourselves. We decided to go swimming in the sparkling, clean water but found that it was unbearably cold. We quickly jumped in and out and were very invigorated! In the evening, we lit a fire on the shore and watched the stars come out until the bugs drove us into the cabin. We sealed up for the night, taped all the openings, and began our first of many, many card games. In fact, during the entire trip, we played board games or cards almost every night, especially after the sun started setting at 6:00 p.m.. The next day, we had to start towards Little Current because we were getting two extra crew members – Nick’s cousins. We stayed overnight at Snug Harbour, another pretty anchorage. It has a narrow entrance but opens up to a huge bay with enough room for forty boats. We swam (the water was considerably warmer), explored ashore and relaxed. After supper, we sat outside for hours. it was the first night since we had left home that we weren’t sent down below by mosquitoes. As we sat talking and listening to the water gently rock the boat, we watched the moon rise – it was orange and completely full. I have yet to see another moon as beautiful as the one rising above Snug Harbour that night. The following morning, we reached Little Current good and early. There is a swing bridge that opens for fifteen minutes on the hour, so we had to time our arrival. We didn’t want to wait in front of the bridge for forty-five minutes. We also wanted to get a spot on the dock. Little Current is a very busy harbour in the summer and has very limited docking. (It has recently installed many more docks and upgraded the washrooms – huge difference!) During the time we were there, it was not uncommon for boats to raft three and four deep or for boaters to circle around the harbour, waiting for people to leave. We docked without incident (a miracle for us!) and went ashore. I found a banking machine and loaded up with cash. I was to make this mistake a couple of more times during our trip but finally learned to get enough money to last us two or three weeks. As for the dinghy motor, Dennis had to buy a brand new one. We picked up our new crew members and made our way to the Heywood Islands. We anchored between two islands but it was quite unprotected if the wrong wind came up. The weather forecast called for good weather, so we stayed put among the fifteen or so other boats. 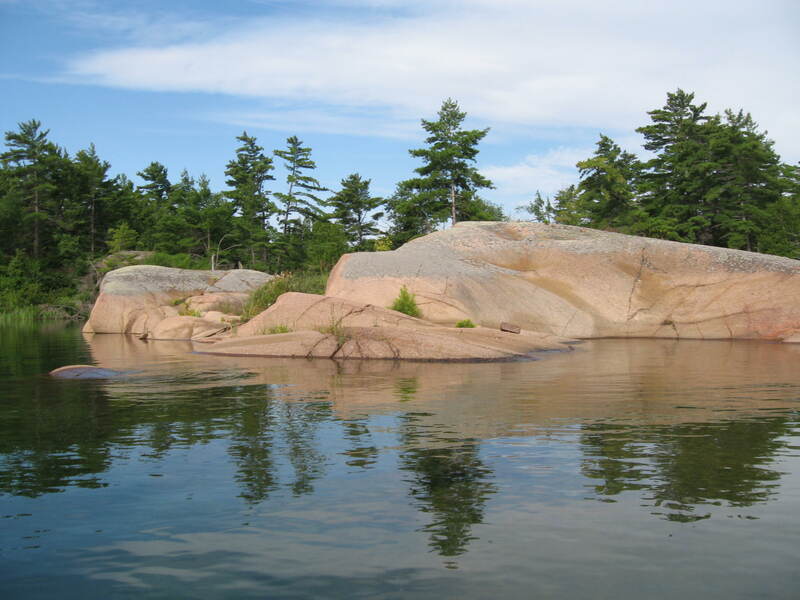 The day was beautiful – hot and sunny – a perfect day for the North Channel. We swam, went dinghy riding and played with the new solar showers and shower enclosure. That evening we went ashore and built a fire. We also built statues out of the tons of flat rock along the shore. This activity was cut short though because Nick got his thumb caught between two rocks. After returning to the boat, Dennis visited The Sea Witch while the kids played poker and I read my book on deck. It was a calm, clear evening until we heard a heated exchange between two boaters. A man in a sailboat had rowed over to a big powerboat and apparently asked the owners to shut off their generator. Well, we hadn’t even heard the generator going until the man in the sailboat made the request but we sure did hear them argue! So did everyone else in the anchorage – many heads had popped out. Listening to the men bicker was much more entertaining than TV. Much to our disappointment, the boaters reached a stalemate and the entertainment ended when the sail boater rowed furiously back to his boat. When the generator stopped about half an hour later, we did notice a big silence. The next evening while we were back in Snug Harbour, another argument occurred between boaters. We were beginning to wonder if this was normal behaviour. Fortunately, it wasn’t. Most people are considerate of others and at almost every anchorage or marina, we had no problems with people offending others. At Snug Harbour though, the problem again was noise. Someone was playing Bob Dylan – full blast. We were at the far end of the anchorage and could hear every word clearly. The music got louder and several boaters began honking their horns. Finally, the boater got the message and turned the music down. We could still hear it, but it was much softer. When it became dark, the music was cranked up again. Finally, a lady rowed over to the boat and asked politely if the boater could turn down the music. He did and everybody in the anchorage breathed a big sigh of relief. The next morning, we sailed back to Little Current to drop off the crew – including Nick. They were going to stay with their grandparents for a few days. Dennis and I then sailed off to Logan’s Bay for two days of peace and quiet. The weather was not good and it rained for most of the two days. Our anchorage was bleak and dreary. We were ready to move on to Gore Bay. In Gore Bay, we picked up Nick and after waving good-bye to my parents, we bobbed off to the Benjamins. I was very sad because I didn’t know when I’d see my family again and we were heading into unfamiliar waters. However, I perked up considerably when I saw the Benjamins. Gigantic mounds of smooth, pink rock rose out of the water. We picked our way carefully into safety and lowered the anchor. We had a good opportunity to explore the island and discovered numerous footpaths running throughout. We walked from one end of the island to the other and took time to see how ingenious other boaters were in their anchoring skills. Boats were tied off to trees, anchored in tiny private spots or lay in a protected area. The next morning, the weather turned cool as we headed out. We decided to try the Otter Islands as our next anchorage but were disappointed. It was very weedy and the water was brownish, we were weren’t interested in swimming. As we waited for the day to end, we feasted on outback oven pizza and cake. They were both delicious and were were amazed once again at how this little oven cheered us up. The recipes were simple and the results were almost always excellent! We couldn’t leave Otter Island fast enough, so at the crack of dawn, we ailed towards Long Point, a secluded anchorage near Blind River. We were very careful reading the chart as there were treacherous rocks hidden under the water. The zigzagging course brought us through a narrow passage which opened up into a bay. There were several boats anchored, so we tied the bow to an island and threw out a stern anchor. Long Point immediately became one of our favourite anchorages. The variety of land and seascapes were numerous. There was a mountain to clim, berries to pick and many ledges, shelves and recesses both in and out of the water to explore. We circumnavigated the island several times by dinghy and found even more places to investigate. We promised ourselves that we would visit Long Point again someday. The next day, we reluctantly left Long Point and sailed to Blind River. We stayed at the marina for two nights. It was clean, spacious and the facilities were excellent. The only problem with Blind River was that the town itself was quite a hike away. However, we badly needed exercise and made several trips back and forth carrying groceries and boat supplies. Dennis’ parents visited us from Sudbury and treated us to lunch. After they left, we had a fast food restaurant binge and ate all of our meals away from the boat. We ate a Tim Horton’s McDonald’s, KFC, and Pizza Hut and tried to justify to ourselves that we wouldn’t be eating out a lot in the future. Ha! later on, most of our entertainment money was spent on meals, just so we could get away from the boat. After two days, we left Blind River and were able to test out the GPS. On our way to Meldrum Bay, fog descended upon us. Nick was sent up to the bow to blow the foghorn, I steered the boat SLOWLY, and Dennis made frequent readings on the GPS. We had no sense of direction and it seemed we were going around in circles. However, the GOS worked wonderfully and kept us on a straight course. After two hours of fog, it suddenly lifted and we basked in the sunshine. My midafternoon, we had anchored in Meldrum Bay and went ashore. It was in Meldrum Bay that we were made to feel like second class citizens because we were anchored instead of docked. It was a shock to be treated in such a manner. 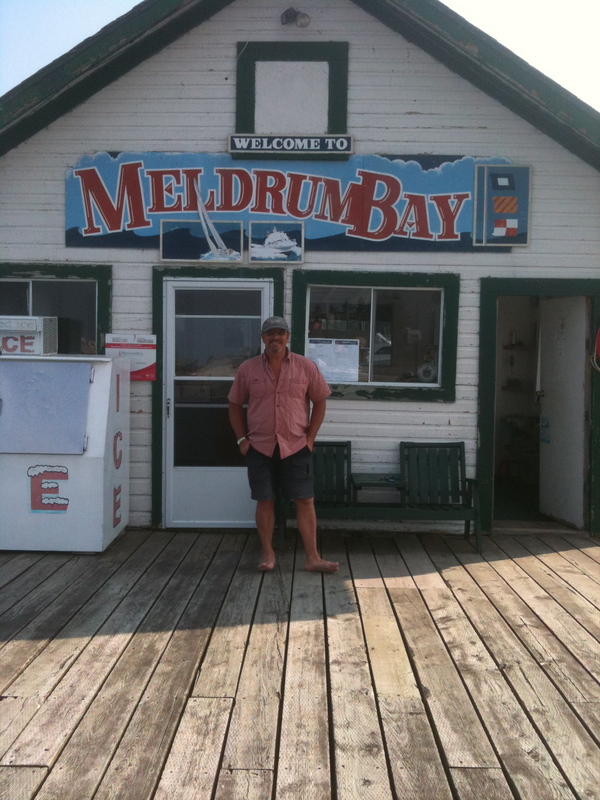 Unfortunately, the Meldrum Bay experience was repeated several times throughout the trip. 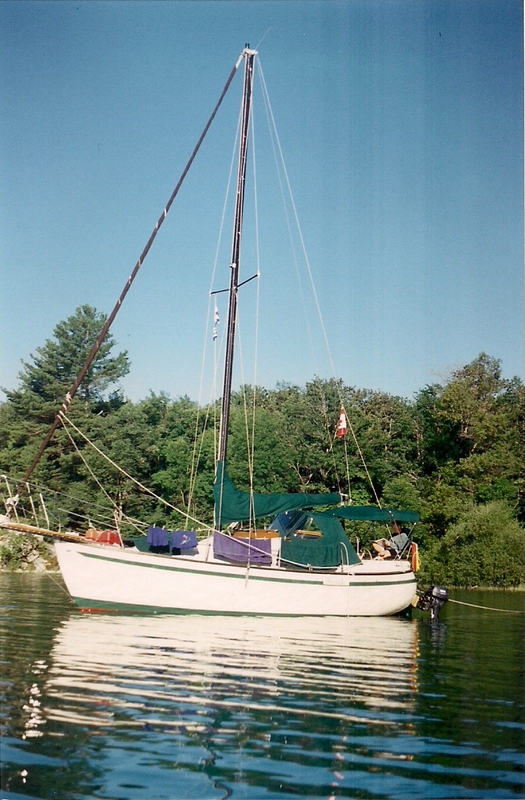 Like many boaters, we had a budget which did not allow us to stay at a marina every night. We when were in a port, we would anchor in the designated area and take the dinghy ashore. Many marinas had a dinghy dock so that anchored boaters could tie up and feel welcome. Other places did not. The people who greeted us at Meldrum Bay charged us $5.00 to tie our dinghy up. Although they were friendly enough, they certainly wanted our money. A sign posted in the washroom informed us that showers cost $3.00 for twenty minutes. Extra time, cost extra money. And to top it off, the general store employee was very rude to Dennis when he bought ice. “You have to pay for that, you know,” he snarled at Dennis, as if he were about to steal a block of ice. We were on a budget but money wan’t that tight! We were anxious to leave and were very disheartened about the way we were treated. However, after talking to others, we decided that Meldrum Bay was a place to hate or love. Some people had wonderful encounters there and others had bad experiences. It must depend on whether or not you go to the marina. With already having bad feelings about Meldrum Bay, a strong north wind came up at midnight and rocked the boat all night. I didn’t sleep at all because I was sure the anchor would break loose and we would crash into the other boats. The anchor held though and the net day we gladly left. The weather continue to b cold and blustery, so we moved our itinerary up and hoped to go south a little more quickly. A weather pattern began to emerge. There were two temperatures – too hot or too cold. Since we had no heating or air conditioning, we suffered either way. But, we made the best of it and either dressed for the Arctic or for the tropics! We wanted to take a side trip to Sault Ste. Marie and visit with friends. It was quite a bit out of our way, but it was worth it. The first night on our way to the Soo was spent in Harbor Island – an American anchorage. The second night was spend near Fort St. Joseph which turned out to be a really neat anchorage. Although we arrived late and the wind was cold, we went ashore and studied the remains of the old fort. We learned that any soldier sent there was condemned to isolation, frigid temperatures and long, hard winters. It must have been a severe life and it was no wonder that most hated the posting. The way to Sault Ste. Marie by water is via the St. Mary’s River. After three weeks of Lake Huron, we were ready for a change. The river was ideal. It was CALM. The only worry was the wake from the other boats and most were considerate of us. Even the tankers would skirt around us and slow down as they passed us. We would cut into their wake though, so we wouldn’t get swamped. Sault Ste. Marie was a great place to visit. The Roberta Bondar Marina, located quite near the locks, was perfect. It was clean, not too crowded and had a shopping mall within walking distance. There was a farmer’s market and during the evenings, we were entertained by outdoor concerts. We also made full use of the exercise path and took in a movie. We couldn’t ask for a better marina an were quite reluctant to leave after two days. However, the weather was not getting any warmer, so we pushed on southward.